Preheat the oven to 450 degrees F. Melt the butter with 2 tablespoons vegetable oil in a skillet; transfer to a bowl. Heat the remaining 2 tablespoons oil in the skillet. Add the onion, garlic and jalapeno and cook until soft, about 3 minutes. Add the chili powder, cumin, cinnamon and 1 teaspoon salt; toast 30 seconds. Add the tomato and cilantro and cook until slightly dry, about 2 minutes. Stir in the chicken and sour cream and warm through. Remove from the heat. 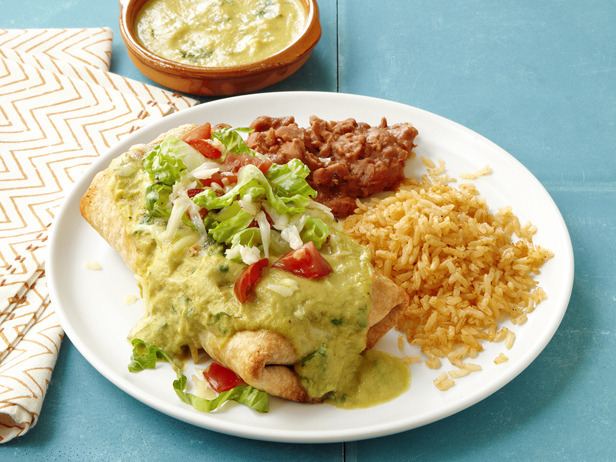 Put the chimichangas seam-side down on the baking sheet; brush with the butter-oil mixture. Bake 8 to 10 minutes per side, brushing again after you flip. Top with the sauce, more cheese, lettuce and tomato. Serve with rice and the remaining beans. Bring a medium pot of water to a boil. Meanwhile, beat the cream cheese with a mixer until smooth. Add the remaining 2 1/2 cups sugar and beat until just light, scraping down the sides of the bowl and beaters as needed. 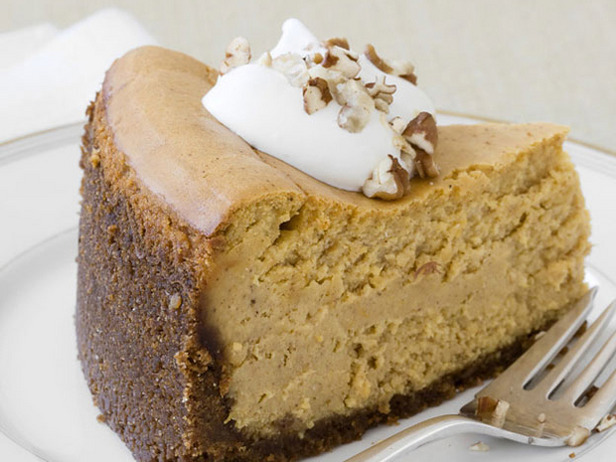 Beat in the sour cream, then add the pumpkin, eggs, vanilla, 1 teaspoon salt and the spicesand beat until just combined. Pour into the cooled crust. Gently place the roasting pan in the oven (don't pull the rack out) and pour the boiling water into the roasting pan until it comes about halfway up the side of the springform pan. Bake until the outside of thecheesecake sets but the center is still loose, about 1 hour 45 minutes. Turn off the oven and open the door briefly to let out some heat. Leave the cheesecake in the oven for 1 more hour, then carefully remove from the roasting pan and cool on a rack. Run a knife around the edges, cover and refrigerate at least 8 hours or overnight. Make the blondies: Preheat the oven to 350 degrees F. Line a 9-by-13-inch baking pan with foil, leaving an overhang on two sides; butter the foil. Pulse 1/2 cup walnuts in a food processor until almost fine (do not overprocess). Whisk the ground nuts, flour, baking powder, baking soda and salt in a medium bowl. Beat 10 tablespoons butter and the brown sugar with a mixer on medium speed until fluffy, about 2 minutes. Beat in the eggs, one at a time, scraping down the bowl with a rubber spatula. Beat in the vanilla. Gradually beat in the dry ingredients until just combined. Fold in the white chocolate and the remaining 1/2 cup walnuts. Spread the batter in the prepared pan and bake until the blondies are light brown around the edges and spring back when pressed, about 30 minutes. Cool slightly on a rack. Use the foil to lift the blondies out of the pan, then cut into large bars. 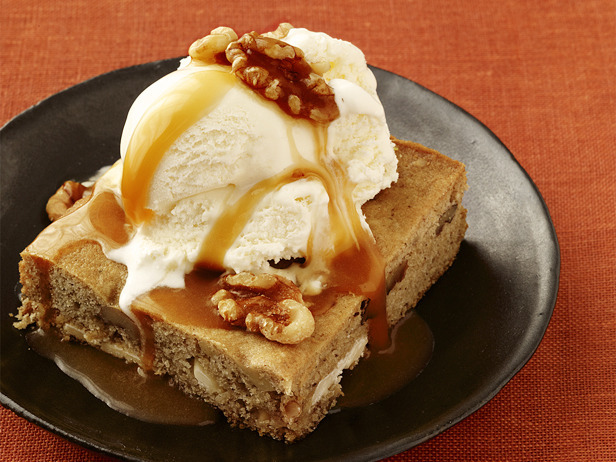 Serve warm topped with ice cream, the maple-butter sauce and the walnuts. Meanwhile, prepare the bread bowls: Using a sharp knife, cut a circle into the top of each loaf, leaving a 1-inch border all around. Remove the bread top, then hollow out the middle with a fork or your fingers, leaving a thick bread shell. Add the cheese to the soup and whisk over medium heat until melted. Add up to 3/4 cup water if the soup is too thick. 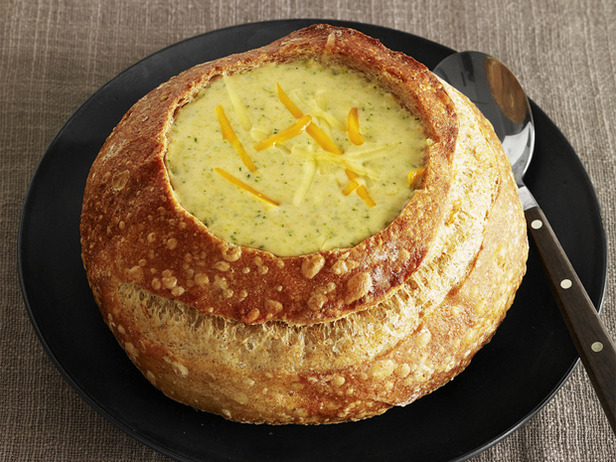 Ladle into the bread bowls and garnish with cheese. Coat a large nonstick skillet or griddle with cooking spray and heat over medium heat. Working in batches, pour about 1/4 cup batter into the skillet for each pancake. Cook until bubbly on top, about 4 minutes, then flip and cook until the other side is golden brown, about 2 more minutes. 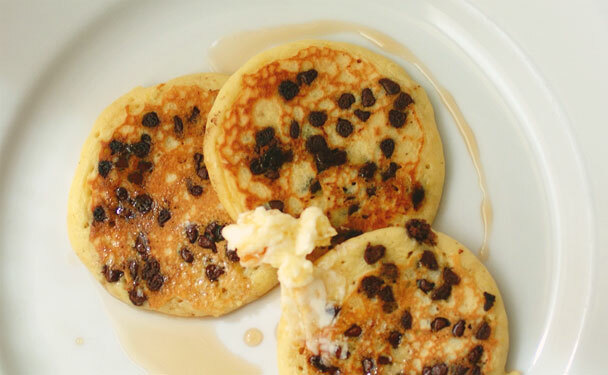 Transfer the finished pancakes to a baking sheet and keep warm in the oven. 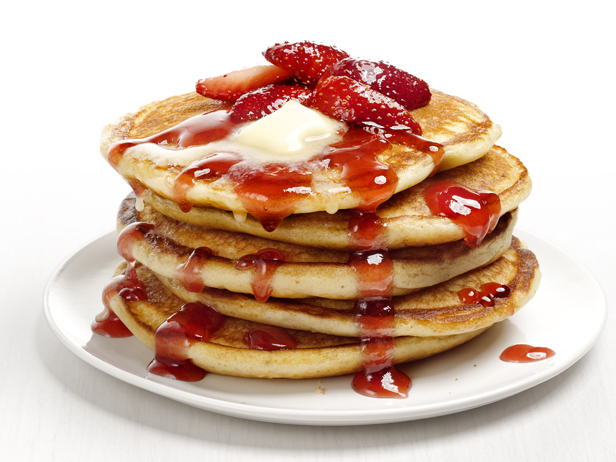 Serve the pancakes topped with the strawberry sauce; top with butter, confectioners' sugar or whipped cream, if desired. Make a taco mold by folding a 5-foot long piece of heavy-duty aluminum foil into a block that is approximately 8 inches long, 4 inches high and 2 inches deep, forming a shape to mold the taco. Set aside. Heat the peanut oil in a 12-inch cast iron skillet over medium heat until it reaches 350 degrees F on a deep-fry thermometer, about 5 minutes. Adjust the heat to maintain the temperature. Shape 1 tortilla around the aluminum foil mold, forming a taco shape. Use tongs to hold up the sides against the mold and put the bottom of the tortilla into the hot oil and fry for 20 seconds. Lay 1 side of the tortilla down in the hot oil and fry for 30 seconds. Flip the tortilla over and fry for an additional 30 seconds. Remove the taco shell to a cooling rack set over a newspaper lined half sheet pan and cool for 30 seconds before removing the mold. Sprinkle the hot tortillas with kosher salt, to taste. Repeat frying procedure with the remaining tortillas. Keep the taco shells warm in the heated oven while preparing the filling. Drain all but 2 tablespoons of the peanut oil from the skillet and return to medium heat. 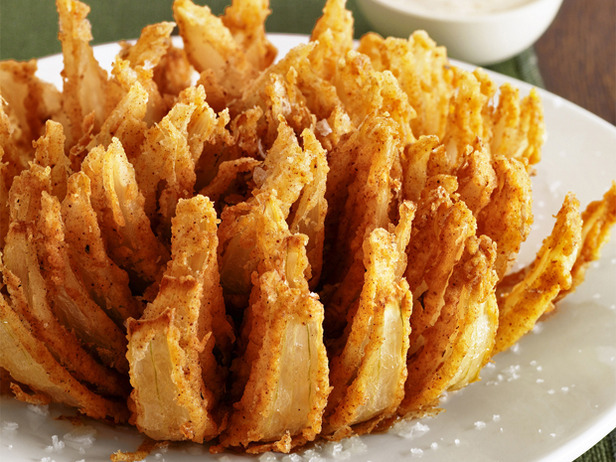 Once the oil shimmers, add the onion and cook until softened and lightly browned around the edges, about 3 to 4 minutes. Add the ground meat, 1 teaspoon salt, and garlic. Cook until browned, about 3 to 4 minutes, stirring occasionally, to break up the meat. Add Taco Potion and beef broth. Bring to a simmer and cook, uncovered, until sauce is slightly thickened, 2 to 3 minutes. 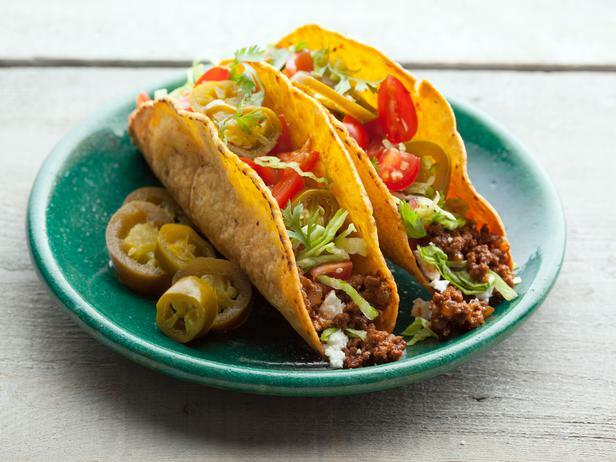 Assemble each taco with meat mixture, panela, jalapeno slices, lettuce, tomatoes, and cilantro. Serve immediately. Remove the chicken to a clean rack to drain, sprinkle with salt and let rest a few minutes. Repeat with the remaining chicken. Serve hot or at room temperature. Add oil to hot pan. Add chicken to the pan and sear meat by stir frying a minute or 2. Add mushrooms and cook another minute or two. Add salt and pepper to season, then garlic and ginger. Cook a minute more. Grate zest into pan, add bell pepper bits, chopped water chestnuts and scallions. Cook another minute, continuing to stir fry mixture. Add hoisin Chinese barbecue sauce and toss to coat the mixture evenly. Transfer the hot chopped barbecued chicken to serving platter and pile the quartered wedges of crisp iceberg lettuce along side. Add wedged oranges to platter to garnish. To eat, pile spoonfuls into lettuce leaves, wrapping lettuce around fillings and squeeze an orange wedge over. 1. Make salsa: Preheat oven to 400°. Line a baking sheet with foil and top with tomatoes, onion, garlic, and jalapeño. Bake until softened, about 25 minutes, turning ingredients halfway through baking. Remove from oven and let cool. 2. Core tomatoes, peel onion and garlic, and stem jalapeño. Put the vegetables, lime juice, cilantro, and salt in a food processor and pulse just until chunky and incorporated. Transfer salsa to a bowl. 3. Prepare chiles: Preheat broiler. Arrange poblanos on foil-lined baking sheet in a single layer and broil 2 to 3 in. from heat until blackened, turning as needed, 10 to 12 minutes. Put chiles in a bowl, cover, and let sit 10 minutes to loosen skins. 4. Peel chiles, pull out stems (keeping chiles as intact as possible), and remove seeds with a spoon or your fingers. Blot with paper towels. Preheat oven to 200°. 5. In a bowl, combine chopped onion and shredded cheese. Squeeze handfuls to form 6 narrow logs. Carefully stuff logs into chiles through stem ends. 6. Pour oil into a large pot to a depth of 2 to 3 in. and heat to 375°. Meanwhile, separate 5 eggs. In the bowl of a mixer, beat whites until soft peaks form. In another bowl, whisk yolks with 1/3 cup flour and 1/4 tsp. salt. Add a spoonful of whites to yolk mixture and whisk to combine, then gently fold yolk mixture into whites just until incorporated. 7. Put 1/2 cup flour in a shallow bowl. Using tongs or your hands, dip a chile first into flour, then into egg batter, turning gently to coat. Gently lower chile into hot oil. Repeat with a second chile. Cook until browned, gently turning once with tongs, about 4 minutes total. Transfer chiles to a baking sheet lined with paper towels and keep warm in the oven. Cook remaining chiles the same way. 8. 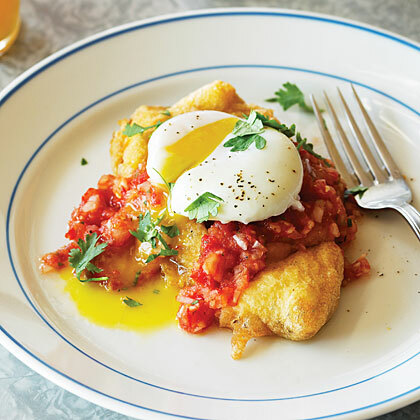 To poach eggs, fill a wide, deep frying pan with enough water to cover an egg out of the shell by about 1 in. Heat water until 1 or 2 bubbles break the surface. Reduce heat until bubbles form on pan bottom and occasionally pop to the surface. Break open remaining 6 eggs, one at a time, into water, keeping eggs close to the surface. Cook until eggs are done the way you like, 3 to 5 minutes for soft yolks with firm whites or 7 to 10 minutes for firm yolks and whites. Remove eggs from water with a slotted spoon and transfer to a plate. 9. Divide chiles among 6 plates, top each with a poached egg and a spoonful of salsa, and serve remaining salsa on the side. Heat 1 tablespoon oil in a large nonstick skillet over medium-high heat. Add bell pepper, and cook, shaking skillet often, until pepper blisters, 2 to 4 minutes. Stir in 1 tablespoon soy sauce. Transfer to a plate; wipe skillet clean. Place each beef slice between plastic wrap; pound lightly until 1/8 inch thick. Season with salt and pepper. Divide bell pepper and scallions among slices. Roll tightly into bundles; secure each with a toothpick. Heat remaining tablespoon oil in same skillet over high heat. Working in two batches, sear rolls until browned on all sides, 3 to 4 minutes. Transfer to a plate; cover to keep warm. Wipe skillet clean. Add 2 tablespoons water, remaining 2 tablespoons soy sauce, vinegar, and sugar to skillet. Cook over medium heat, stirring, until sauce is reduced and syrupy, 2 to 3 minutes. Remove toothpicks. Drizzle rolls with sauce. Preheat oven to 450 degrees, with racks in upper and lower thirds. Brush a rimmed baking sheet with oil. In a small bowl, mix together 2 tablespoons mustard and ketchup. In a medium bowl, combine beef, egg, panko, 1/2 cup cheddar, 1/2 teaspoon salt, and teaspoon pepper. Form into four 2-by-4-inch loaves; place on baking sheet. Brush with mustard mixture; top with remaining 1/2 cup cheddar. On another rimmed baking sheet, toss potatoes with 1 tablespoon oil; season with salt and pepper. Transfer meatloaves to upper rack of oven, and place potatoes on lower rack. Bake until loaves are cooked through, 15 to 20 minutes, rotating sheets after 10 minutes. Remove loaves from oven; continue to roast potatoes until tender, about 5 minutes. Meanwhile, in a large bowl, whisk together remaining tablespoon oil, remaining teaspoon mustard, and vinegar; season with salt and pepper. Add lettuce to bowl, and toss. 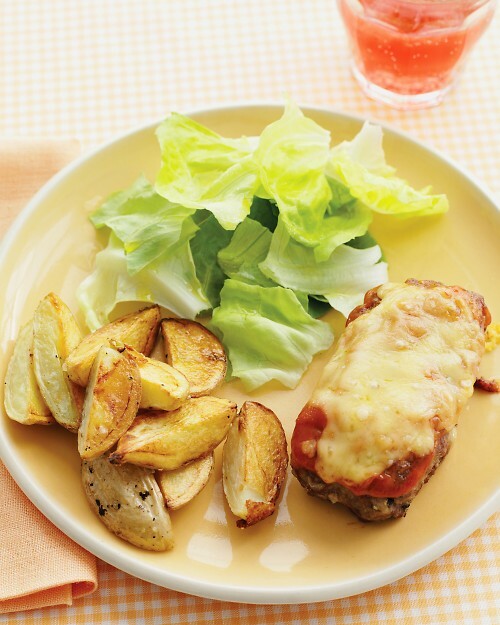 Serve meatloaves with potatoes and salad. Preheat oven to 400 degrees. Using a paring knife, trim tortillas to fit a 9-inch springform pan (use the removable bottom of the pan as a guide). Assemble pan with the bottom upside down; lightly oil bottom and sides. Set aside. In a large skillet, heat oil over medium. Add onion, cumin, and red-pepper flakes; season with salt and pepper. Cook until onion has softened, 3 to 5 minutes. Stir in tomato paste. Raise heat to medium-high; add beef and garlic. Cook, breaking up meat with a spoon until no longer pink, 4 to 6 minutes. Add corn and spinach; stir until spinach has wilted, about 2 minutes. Place one tortilla in the prepared pan. Spreading evenly, top with 1 1/2 packed cups beef mixture, then 1/2 cup cheese. Repeat with two more layers. 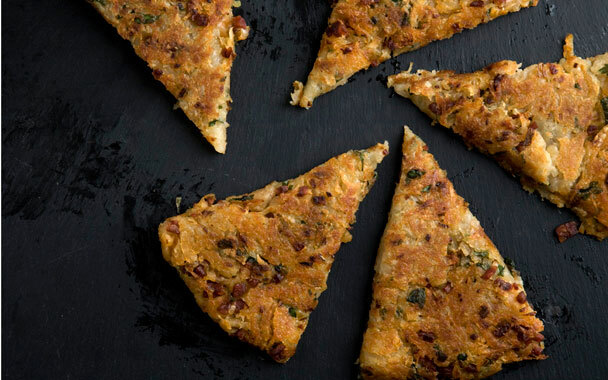 Top with last tortilla, and sprinkle with remaining 1/2 cup cheese. 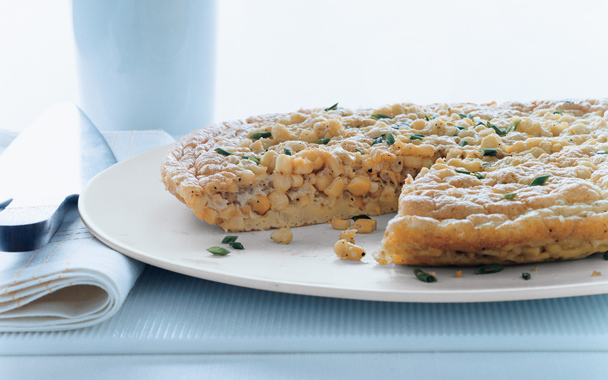 Bake pie until top is lightly browned, 15 to 20 minutes. Run knife around edge of pan; remove sides. Using two wide metal spatulas, lift pie from bottom of pan, and transfer to a cutting board. Cut into wedges. 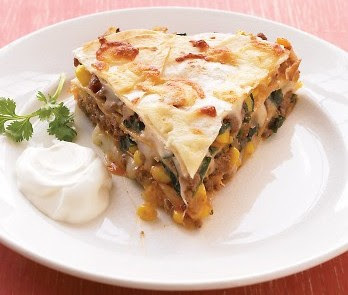 If desired, serve with cilantro and sour cream. Preheat oven to 500 degrees, with racks in upper and lower thirds. 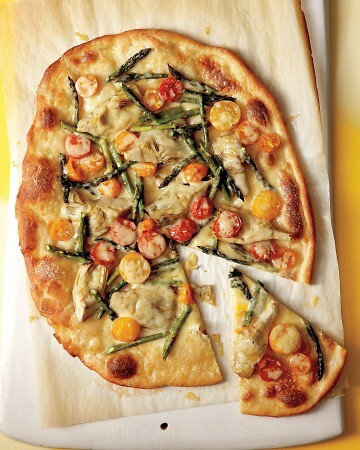 In a medium bowl, combine artichoke hearts, asparagus, and tomatoes. On a large piece of parchment paper, brush 1 dough half with artichoke-heart marinade and roll out to a 14-inch-long oval. 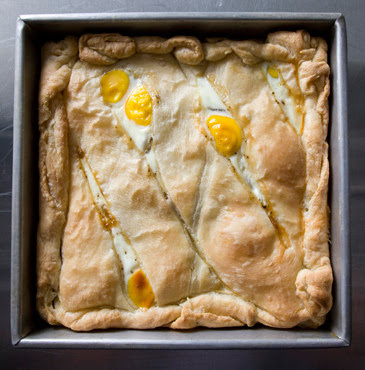 Transfer dough on parchment to a rimmed baking sheet and top with half the vegetables, leaving a 1-inch border. Brush border with marinade and season pizza with salt and pepper. Repeat to make second pizza. Bake pizzas 10 minutes, rotating sheets halfway through. Sprinkle pizzas with cheese and bake until crust is deep golden and cheese is melted, 3 to 5 minutes. 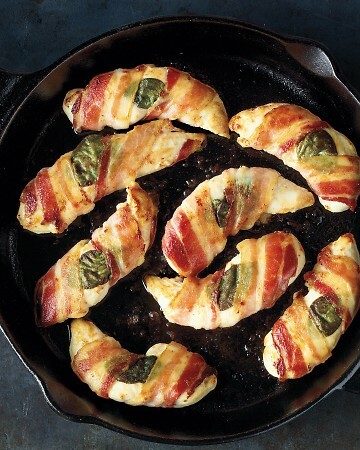 Place a sage leaf on each chicken tender, then wrap each with a bacon slice. In a large skillet, heat oil over medium-high. Add tenders, sage side down, and cook until fat is rendered and bacon is browned, about 6 minutes. Flip and cook until tenders are cooked through, 6 minutes. With tongs, transfer to a wire rack set on a rimmed baking sheet to drain. Bring a large pot of salted water to a boil. Meanwhile, in a large nonstick skillet, heat 1 tablespoon oil over medium-high. Add bell peppers, and cook, tossing, until crisp-tender, 3 to 5 minutes. Add shrimp, and cook, tossing, until opaque throughout, 2 to 3 minutes. Stir in salami and pepperoncini; season with salt and pepper. Cook pasta until al dente; drain, and return to pot. Add remaining 2 tablespoons oil to pasta in pot; season with salt and pepper, and toss to combine. 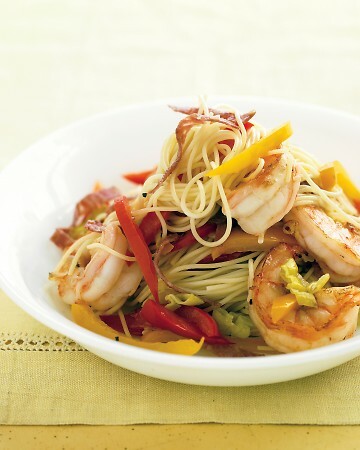 Serve pasta topped with shrimp mixture and pan juices. Set a large pot of salted water to boil. In a large skillet, cook bacon over medium until crisp, 5 to 7 minutes. With a slotted spoon, transfer to a paper-towel-lined plate to drain (leave fat in skillet). Add shallots to skillet; season with salt and pepper. Cook over medium, stirring occasionally, until they begin to soften, 1 to 2 minutes. Add peas and half-and-half; season with salt and pepper. Simmer until slightly thickened, about 2 minutes. Cook pasta in boiling water until al dente, according to package instructions. Reserve 1/2 cup pasta water; drain pasta, and return to pot. 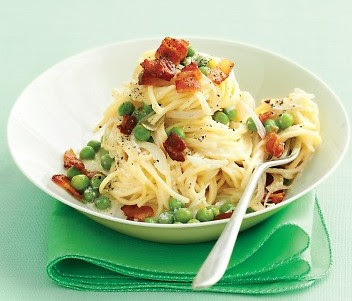 Pour sauce over pasta; toss to combine, adding some reserved pasta water a little at a time to coat. Sprinkle with bacon, and serve immediately. In a large pot of boiling salted water, cook noodles until al dente, according to package instructions. Drain, and rinse under cold water; drain again, and set aside. While pasta is cooking, in a medium bowl, toss chicken with cornstarch; season with salt and pepper. In a large nonstick skillet, heat 1 tablespoon oil over medium-high. 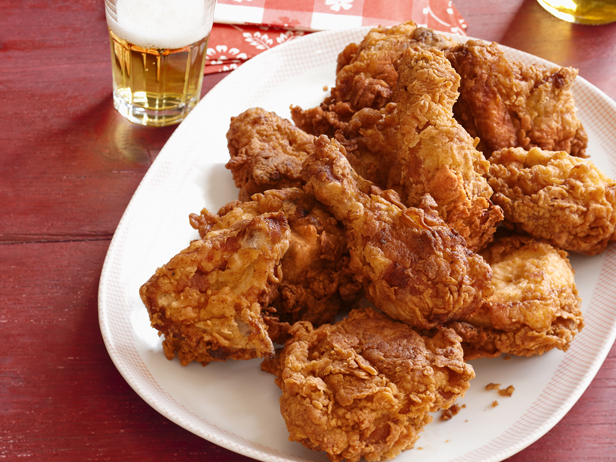 Cook chicken in two batches, until light brown on the outside and opaque throughout, 2 to 4 minutes. Transfer to a plate (reserve skillet). Add remaining tablespoon oil to skillet; add onion and garlic. Cook, stirring frequently, until softened, 1 to 3 minutes. Add cabbage, and cook, stirring frequently, until tender, 2 to 4 minutes. Add edamame, vinegar, soy sauce, chicken, and noodles; season with salt and pepper. Cook, tossing, until noodles and edamame are warmed through, 3 to 5 minutes. Heat the broiler. Put fennel seeds in a small, self-sealing plastic bag, and crush with a rolling pin. Add parsley, brown sugar, 3/4 teaspoon salt, and 1 teaspoon pepper to the bag, and shake to mix. Press the mixture onto the skinless side of the salmon. Broil salmon, skin side down, until it is no longer red in the center, about 8 minutes. Flake the fish with a fork. Meanwhile, in a large pot of boiling salted water, cook pasta according to package instructions until al dente, about 13 minutes. Reserve about 1/2 cup cooking water, and drain pasta. Return it to the warm pot, add spinach, and toss. 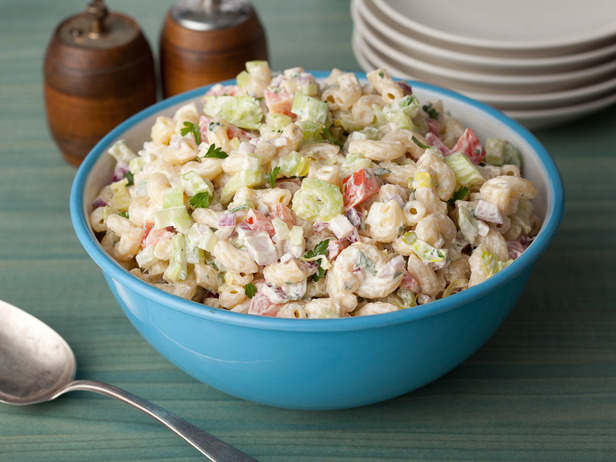 In a bowl, mix together sour cream, lemon juice to taste, 1/2 teaspoon salt, and 2 tablespoons pasta water. Put pasta on plates, top with salmon, and drizzle with the sour-cream mixture. Or simply toss pasta and spinach in the pot with the salmon and the sour-cream mixture, adding pasta water as needed, and serve. 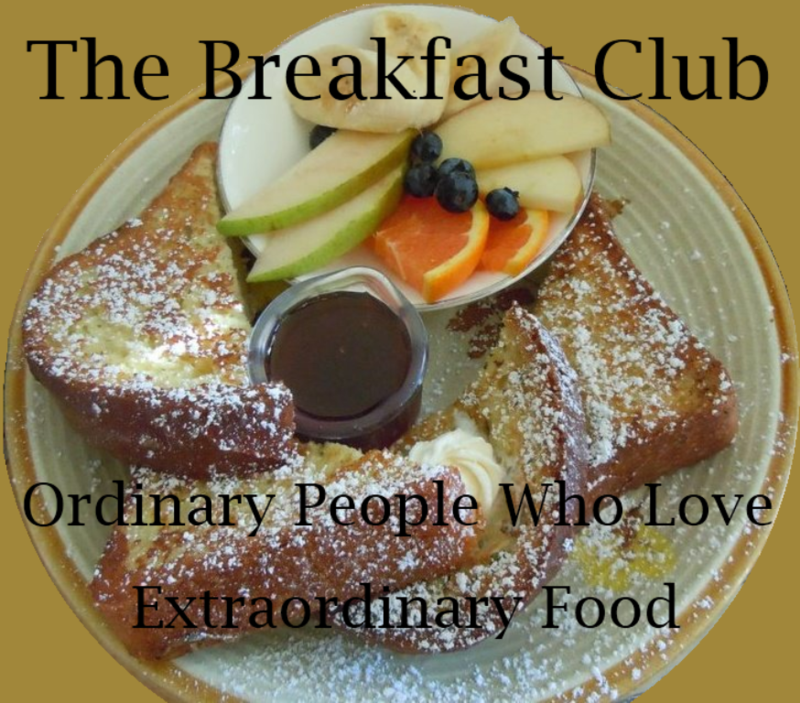 Cook bacon in a 6- to 8-quart heavy pot over medium heat, stirring frequently, until crisp, about 5 minutes. Transfer with a slotted spoon to a small bowl. Pour off all but 2 tablespoons bacon fat. Add onion, carrots, celery, and bell pepper to pot and cook, stirring, until onion is softened, 10 to 12 minutes. Add Yukon gold and sweet potatoes, broth, and water, and simmer, covered, until potatoes are just tender, about 15 minutes. 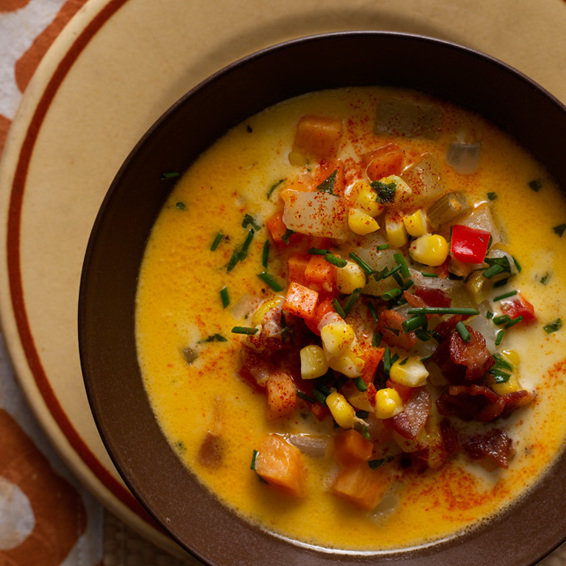 Add corn and cream and simmer, uncovered, 10 minutes. Remove pot from heat, then stir in cheese until melted. Season soup with salt and pepper and stir in bacon and basil. Garnish with fresh chives, scallions, or paprika (if desired). Peel potatoes and cut into 1-inch pieces. Cover potatoes with cold water in a medium pot, then stir in 1 teaspoon salt and simmer until very tender, about 18 minutes. While potatoes simmer, cook garlic and 1/3 cup scallions in 2 tablespoons annatto oil in a small saucepan over medium heat, stirring, until softened, about 2 minutes. Stir in cumin and 1/4 teaspoon pepper and cook, stirring, 1 minute. Add tomato and cook, stirring, 2 minutes. Add milk and bring to a bare simmer, then remove from heat and stir in peanut butter until combined well. Keep peanut sauce warm, covered, off heat. Drain potatoes, then mash in a bowl. Cook remaining 1/2 cup scallions with 1/4 teaspoon salt and 1/4 teaspoon pepper in 2 tablespoons annatto oil in a small saucepan over medium heat, stirring, until scallions are softened, then stir into potatoes along with cheese. 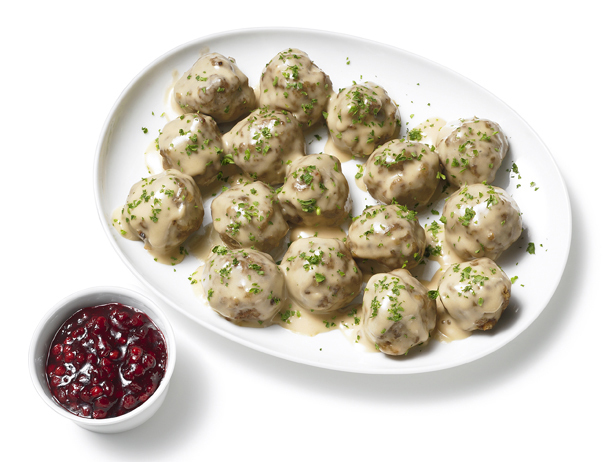 Form potato mixture into 8 balls and flatten each into a 3-inch patty. 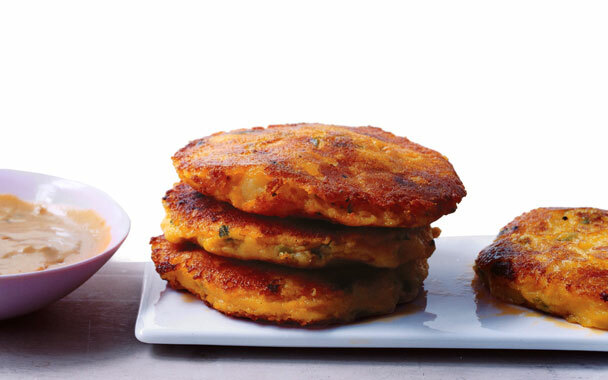 Heat 1 tablespoon annatto oil in a 12-inch nonstick skillet over medium-high heat until hot, then fry cakes in 2 batches, turning over once, until crusty, about 6 minutes per batch. Add remaining tablespoon annatto oil for second batch. 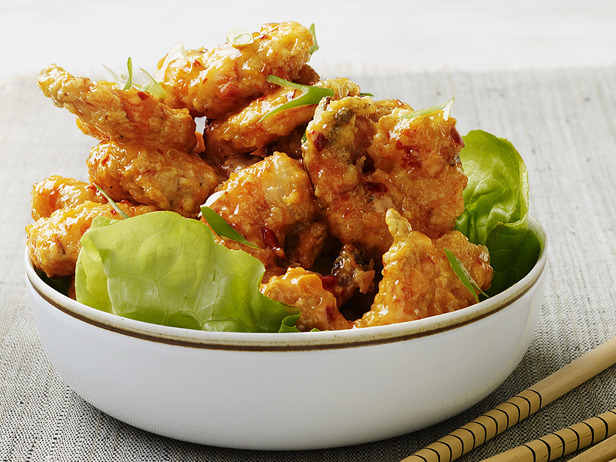 Gently reheat peanut sauce, thinning to a creamy consistency with a little water if necessary. Season sauce with salt and serve with potato cakes. Common in Latin American cooking, this orange oil infuses dishes with instant depth and quite often with their signature golden color. Heat annatto seeds and oil in a very small saucepan over low heat, swirling pan frequently, until oil is bright red-orange and begins to simmer, about 2 minutes. Remove from heat and let stand 10 minutes. Strain annatto oil through a fine-mesh sieve into a bowl, discarding seeds. Annatto oil keeps, covered and chilled, indefinitely. Preheat oven to 350°F with rack in middle. Lightly butter muffin cups with some of melted butter, then sprinkle with granulated sugar. Roll bread slices with a rolling pin to flatten. 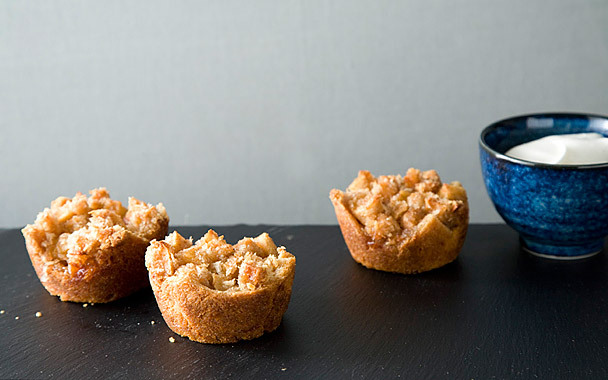 Brush both sides with some of remaining melted butter, then gently fit into muffin cups. Peel apples and cut into 1/2-inch pieces. Stir together with brown sugar and cinnamon, tossing to coat. Stir inpanko and remaining melted butter. Heap apple mixture into cups, pressing gently. Cover pan with foil and bake 30 minutes. Uncover and bake until apples are tender, about 20 minutes more. Let stand 5 minutes before removing from pan. Serve warm or at room temperature. Put a baking sheet in middle of oven and preheat oven to 375°F. If dough is in 1 piece, cut in half. Roll out each piece into a 12-inch square on a lightly floured surface. Line a 9-inch square baking pan with 1 piece of dough, draping it slightly over sides. 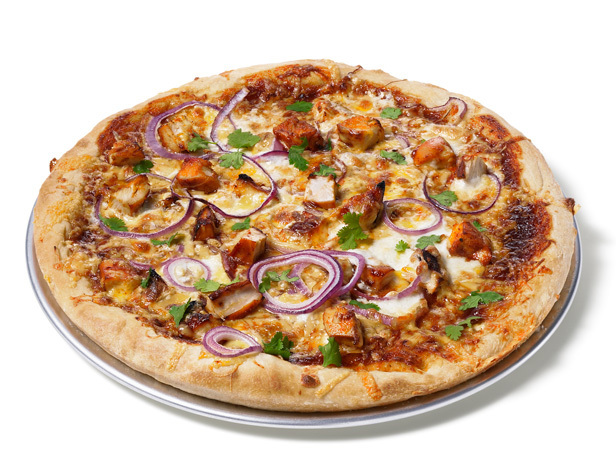 Stir together onions, oil, and 1/4 teaspoon each of salt and pepper and spread in an even layer over dough. Top with prosciutto. Peel potato and thinly slice (about 1/8 inch thick), then arrange in one layer over prosciutto, overlapping slightly. Crack eggs on top of potatoes, gently arranging yolks so they don°t touch one another. Season eggs with 1/4 teaspoon each of salt and pepper. Cut several slits in remaining pastry square and lay over top of pie, then crimp edge and trim. Bake until pastry is golden brown and puffed, 50 to 60 minutes. Add corn to a 4-quart pot of boiling salted water, then remove from heat and let stand, covered, 10 minutes. Drain and, when cool enough to handle, cut kernels from cobs with a sharp knife into a bowl, then scrape cobs over bowl to extract "milk." If using matzo meal (not cake meal), finely grind in grinder. Whisk together ground matzo meal or matzo cake meal, water, eggs, egg whites, salt, and 1/4 cup melted butter until smooth. Let batter rest at room temperature 30 minutes. Cook onion in butter with 3/4 tsp salt and 1/2 tsp pepper in a 12-inch heavy skillet over medium heat, stirring occasionally, until softened and starting to brown, about 7 minutes. Add garlic and cook, stirring, 1 minute. Add mushrooms and cook, stirring occasionally, until tender, about 8 minutes. Stir in cream and milk and simmer, stirring occasionally, until slightly thickened, 6 to 8 minutes. Remove from heat and stir in chives and 1/4 cup cheese. Cool while making crêpes. Lightly brush a 9- to 10-inch nonstick skillet with some of remaining melted butter and heat over medium heat just until butter sizzles. Pour 1/4 cup batter into pan, tilting to evenly coat bottom, and cook until underside is lightly browned, 45 to 60 seconds. Flip with a rubber spatula and cook 30 seconds more. Transfer to a plate and repeat with remaining batter, stacking crêpes as cooked. 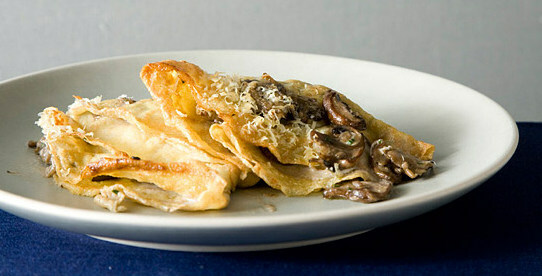 Spread each crêpe with about 1/4 cup mushroom filling and fold in quarters to form a triangle. Arrange crêpes, overlapping slightly, in a 3-qt shallow baking dish. Scatter any leftover mushroom filling over top. Sprinkle with remaining 1/4 cup cheese. Bake until crêpes are golden and edges are crisp, about 25 minutes. Heat a griddle over medium heat until hot and lightly brush with additional oil. Working in batches, pour a scant 1/4 cup batter per pancake onto griddle and sprinkle each pancake with about 1 1/2 teaspoons chips. Cook onion, scallions, and garlic in 1 Tbsp oil in a 12-inch nonstick skillet over medium heat, stirring occasionally, until softened, 3 to 5 minutes. Peel potatoes and coarsely grate. Squeeze any excess water from potatoes and mix with onion mixture, chorizo, parsley, paprika, 1/2 tsp salt, and 1/4 tsp pepper in a large bowl until combined well. Wipe out skillet and heat butter and remaining Tbsp oil over medium heat until butter is melted. Add potato mixture, spreading evenly in skillet and pressing gently to flatten. Cook over medium heat until crisp and golden, 8 to 10 minutes. Invert a large plate over skillet. Holding plate and skillet tightly together, invert hash browns onto plate. Slide back into skillet and press gently to flatten. Cook until golden and cooked through, 8 to 10 minutes more. Cut into wedges and serve. Preheat oven to 325°F with rack in middle. Put bread in a 3-qt flameproof shallow baking dish (not glass). Whisk together whole eggs, yolks, and sugar in a large bowl until pale and thick, about 1 minute. 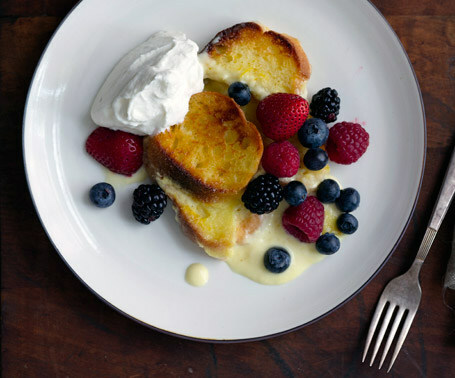 Whisk in zest, lemon juice, and 4 cups cream (chill remaining cup cream) and pour over bread. Press down with a spatula to help bread soak up some of custard. Lightly sprinkle with sugar and bake in a water bath until custard is barely set and edges of bread are golden, 40 to 45 minutes. 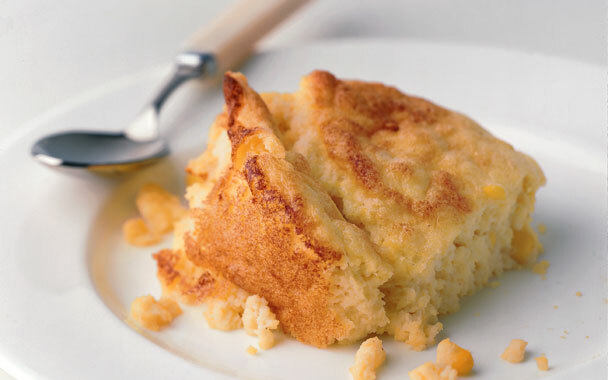 Turn on broiler and broil bread pudding 4 to 5 inches from heat until golden-brown in spots, 2 to 3 minutes. Cool to warm, about 30 minutes (pudding will continue to set). Just before serving, beat remaining cup cream with syrup using an electric mixer or a whisk until it just holds soft peaks. Serve pudding, warm or chilled, with cream. Blend together flour, butter, shortening, baking powder, and salt in a bowl with your fingertips or a pastry blender (or pulse in a food processor) until mixture just resembles coarse meal. Whisk egg with 1/4 cup ice water, then drizzle evenly over flour mixture and gently stir with a fork until incorporated. Squeeze a small handful: If it doesn't hold together, add more ice water, 1/2 tablespoon at a time, stirring (or pulsing) until incorporated. Gather dough and knead just until smooth, 3 or 4 times, on a lightly floured surface (do not overwork, or pastry will be tough). Form dough into 2 (5-inch) disks and chill, wrapped in plastic wrap, until firm, at least 1 hour. Briskly simmer all filling ingredients and a pinch of salt in a heavy medium saucepan, uncovered, stirring occasionally and mashing apples with a potato masher as they soften, until a thick purée forms, about 20 minutes. Cool completely. Divide 1 disk of dough into 6 equal pieces. Roll out 1 piece on a lightly floured surface with a lightly floured rolling pin into a 6-inch round, then put 2 heaping tablespoons of filling in center. Lightly moisten edge with water and fold dough over to form a half-circle, pressing out air around filling, then pressing edge to seal. Transfer to a large sheet of parchment paper and press floured tines of a fork around edge. Make more pies with remaining dough and filling (you may have some filling left over). Set a cooling rack on a large baking sheet or tray. Heat 2 inches of oil in a 4- to 5-quart heavy pot (preferably cast-iron) over medium heat until it registers 360 to 370°F on thermometer. Fry pies, 3 or 4 at a time, turning occasionally, until deep golden-brown, 7 to 8 minutes per batch. Transfer to rack to drain. Return oil to 360 to 370°F between batches. 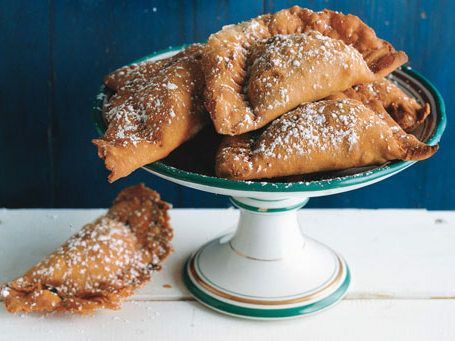 Dust warm pies with confectioners sugar before serving.